Penn Volleyball senior Italia Fields brings a lot of skill to her team as a captain this year. She is know for her leadership on and off the court. Being able to play multiple positions on the court she proves to be a strike force against other teams. Fields has played a total of 206 sets in her career and has accumulated a total of 474 kills, a hitting percentage of .191, 100 blocks, 59 digs, and 1 ace and counting. Fields’ success has led to her choice to go to The Milwaukee School Of Engineering. “I chose The Milwaukee School Of Engineering because the campus is absolutely gorgeous and it’s top ten in the nation for Engineering which is the field i’m going to study,” Fields said. Fields is looking forward to meeting all of the players at the college and she is very eager to finally see what it will be like when she is all on her own and is preparing herself for her life beyond college. 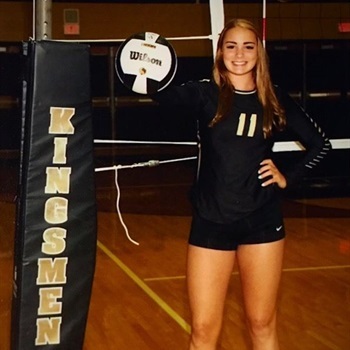 Penn Volleyball Coach Sarah Hendricks said that Fields is an impact player in many ways for the Kingsmen. “Italia has developed into not only a great player but a leader as well,” Hendricks said. “She is very dynamic on the court and can play multiple positions. She is a captain this year, and does a great job of leading on and off the court. Volleyball also provides many light and exciting moments for Fields. Being a student-athlete is a tough job. Fields has proven that with hard work and dedication everything you do to become better will eventually pay off. She can’t wait to get to the next level and is looking forward to see where her life takes her at The Milwaukee School Of Engineering.